LAFAYETTE, CO. - USA Rugby announces renewed contest for the upcoming Americas Rugby Championship (ARC) where the Men's Eagles will face long-time rival Canada at Papa Murphy's Park in Sacramento on Feb 10. The contest against Canada begins at 3 PM PT featured LIVE on The Rugby Channel. Pre-sale tickets for the event will become available on Friday, Dec 8th, with registration for the pre-sale list available on usarugby.org/tickets. This contest against Canada, serves as a renewal of the principal rivalry in the ARC where the United States returns after serving the Canadians a 52-16 loss allowing the Eagles to seal their qualification for the 2019 Rugby World Cup in Japan. Canada, who lost four out of their five final matchups of 2017, including a most recent 57-17 loss to Fiji, stands at No. 21 in the World Rankings and finished the 2016 ARC in third place with an overall record of 4-6 in their two appearances. The Men's Eagles, who have not conceded a win to their rival in the past four years, will look to continue their dominance in a matchup that will surely ignite an exciting atmosphere at Papa Murphy's Park. General Manager Dave Hodges looks forward to the contest acknowledging the Eagles' enthusiasm in traveling to Sacramento and energy around the rivalry. "It is exciting to be back in Sacramento. A number of our players have come from Jesuit High School over the years and we have had great support from the fans at Papa Murphy's Park," said Hodges. "Test matches against Canada are always fiercely contested and we will need to be on top of our game as Canada will come into battle hardened from their two 2019 RWC qualification matches against Uruguay." The exclusive ticket pre-sale for the USA vs Canada match, will be followed by a public on sale date to be announced at a later time. 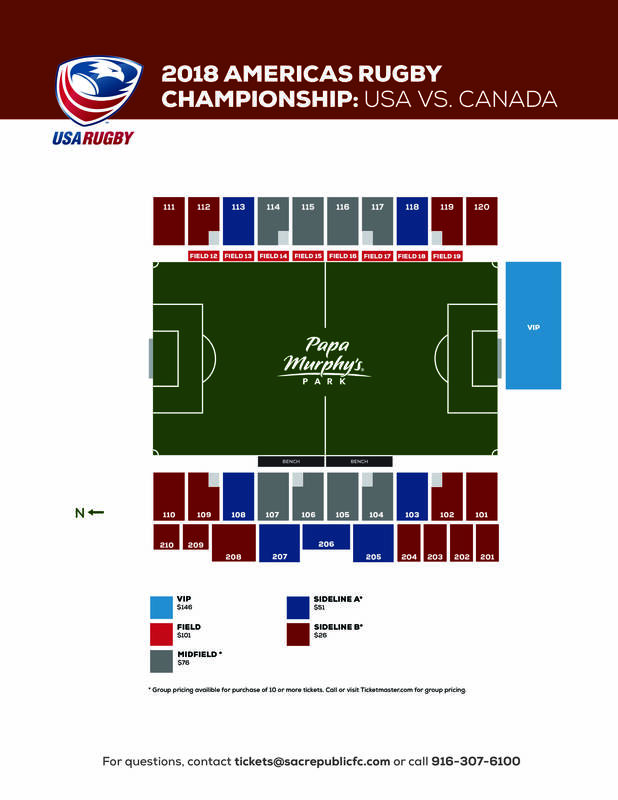 Fans may sign up for the Eagles' pre-sale list on usarugby.org/tickets, subscribe to The Rugby Channel to watch both matches LIVE as well as follow @USARugby on Twitter for updates.